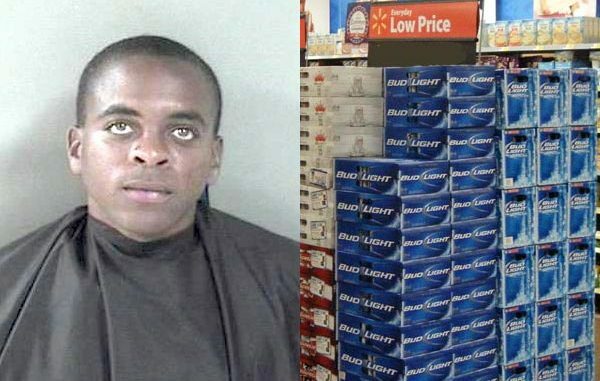 Vero Beach Walmart calls authorities after a man walks out with two boxes of beer. VERO BEACH – A man who walked out of the Walmart store in Vero Beach with two boxes of beer was arrested on charges of retail theft. Darius D. Reynolds, 27, walked into the store through the garden section with an empty shopping cart and proceeded to the beer aisle. Security cameras showed Reynolds selecting two 24-pack boxes of beer and placing them into the cart. He then walked out through the garden area, passing all points of sale, and exited the store. Walmart called the Indian River County Sheriff’s Office and advised them that Reynolds was standing at the bus stop just north of the Vero Beach store. The items were valued at $33.66. Reynolds did not wish to speak with deputies. He was arrested and transported to the Indian River County Jail where he was charged with retail theft.